E3 developed the Electric Vehicle Grid Impacts model (“EVGrid”) to provide custom estimates of the economic costs and benefits associated with EV adoption and programs. Capable of modeling more than 30 electrified vehicle segments, from passenger cars to heavy-duty and off-road vehicles, EVGrid combines utility-specific data with the latest technology and behavioral insights to create EV load profiles that are among the industry’s most robust. In jurisdictions as diverse as California, New York, Ohio, Idaho, Massachusetts, Hawaii, Arizona, and Washington State, EVGrid has consistently shown significant societal and ratepayer net benefits from EV adoption – and E3 has successfully supported clients through a broad range of regulatory filings, investment decisions, and corporate and system planning initiatives. 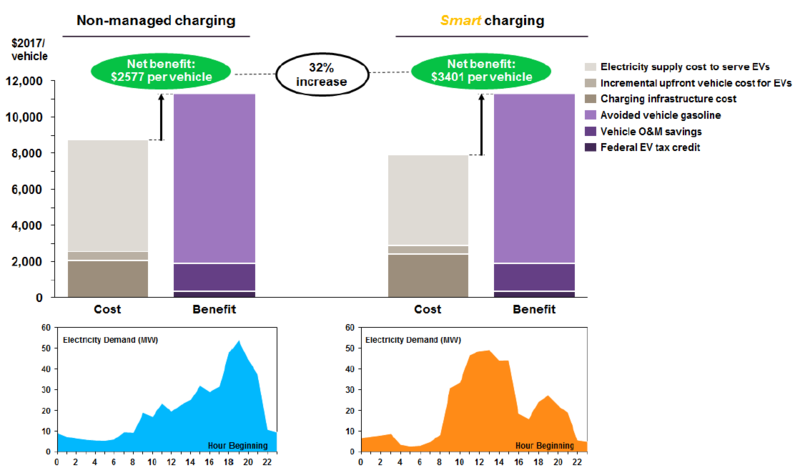 Using EVGrid, E3 calculated the direct economic costs and benefits to adoption of personal, light-duty EVs in O’ahu, Hawai’i, from 2018 to 2045. EVGrid showed how SDG&E’s proposed dynamic vehicle grid integration rate could encourage PEV charging during the mid-day hours, when renewable overgeneration occurs in the spring and fall. EVGrid has supported some of the world’s most advanced planning for electric vehicles. For more information about the EV Grid Impacts model, contact Nancy Ryan or Snuller Price.